Tank looks fantastic. What's your maintenance schedule? Any challenges/setbacks along the way during the past 2 years? Thanks, maintenance in this tank is pretty simple..
- I dose Alk and Ca here and there, Mag just once in a while. I will invest in a GHL standalone doser in the near future for more stability of these elements. 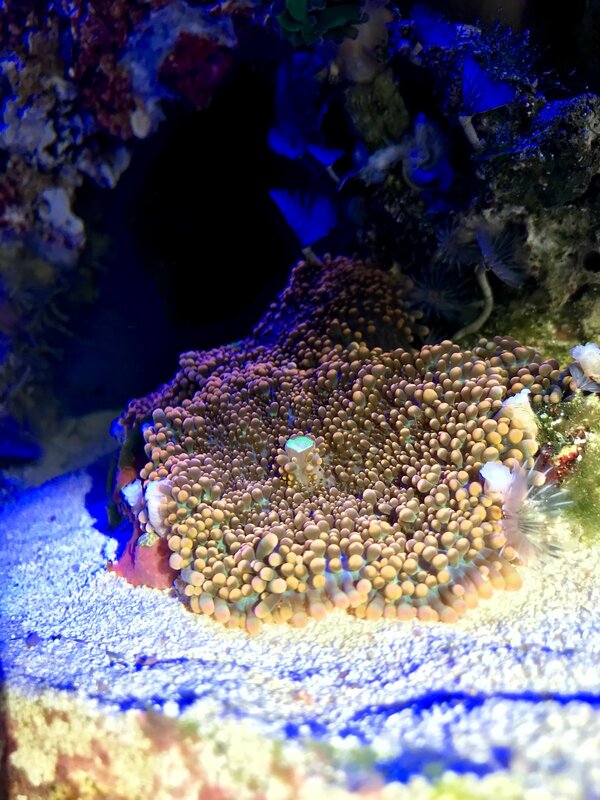 - rocks , sump is getting a good scrub every water change. - skimmer and return pump as well as the lily pipe get soaked in vinegar once a month. I had way too much rock the first time around and detritus was collecting thus resulting in poor water quality , so I cut the rock amount in half and voila, zero dead spots now. Gotta add some more corals next week and let everything grow in...Need some patience. 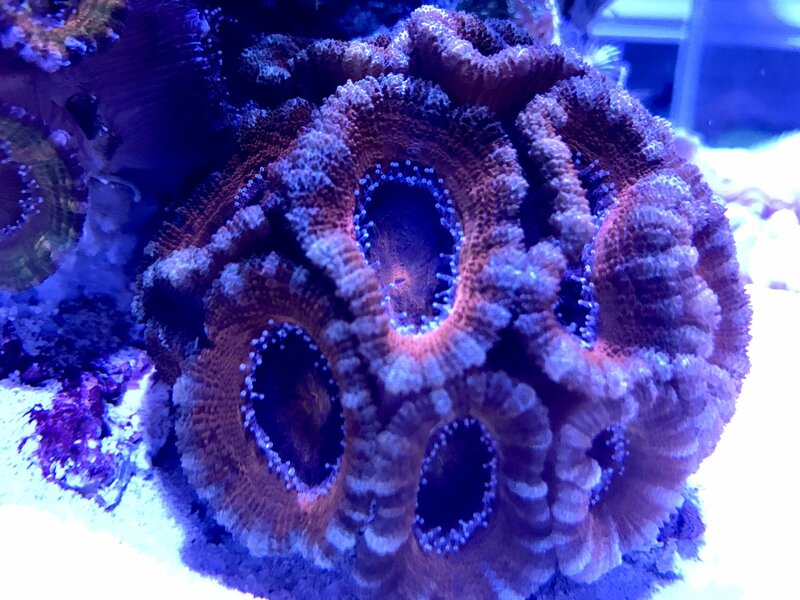 Noticed my acans turned a more red shade rather than the rainbow they were quite a while ago. Lowered the light by 20% for the past week and call me crazy but I’m seeing some improvements on some of the polyps. Picture is enhanced just to show the color better but you get the idea. 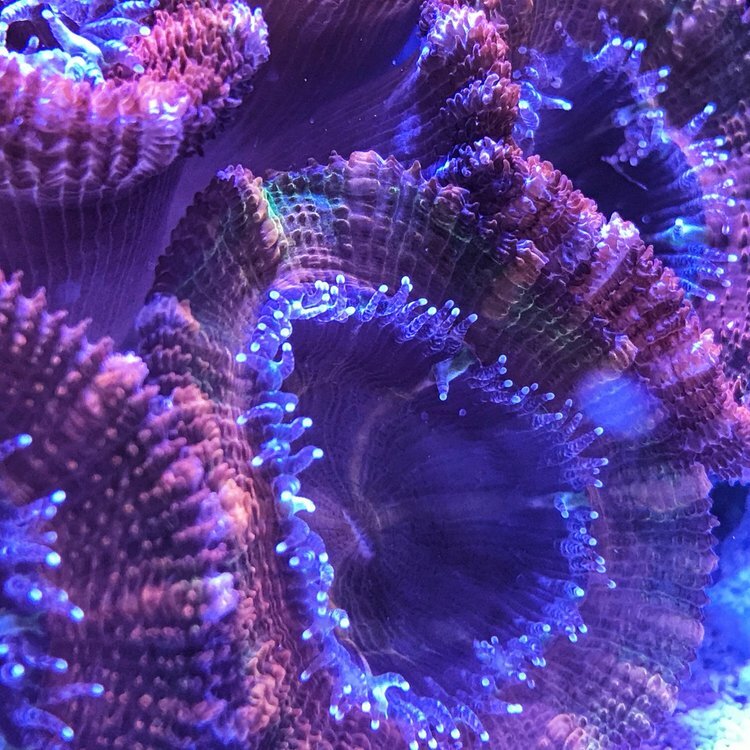 Pretty stoked and just goes to show these acans need low light...how much PAR I have no idea.. I found similarly that my scans did best when in low light. 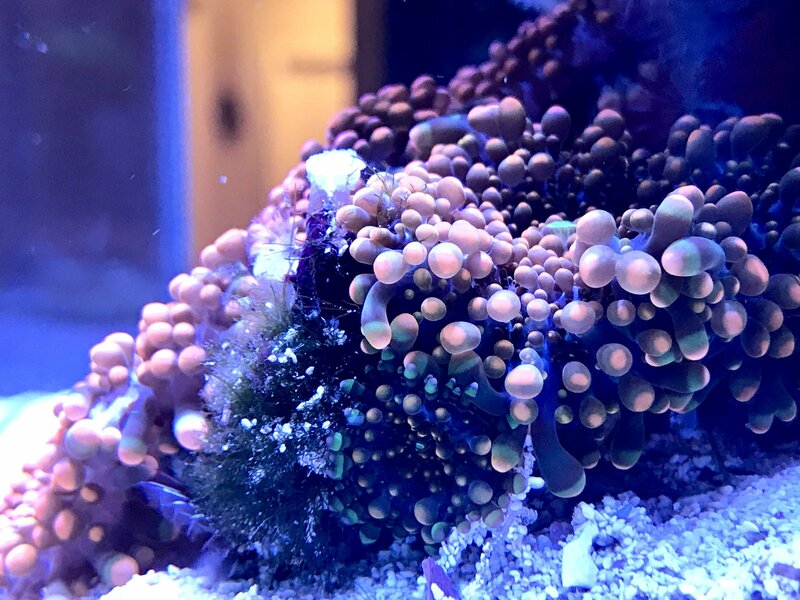 I tried to always place them half in shadow or at the end of the tank and they seemed to do really well. 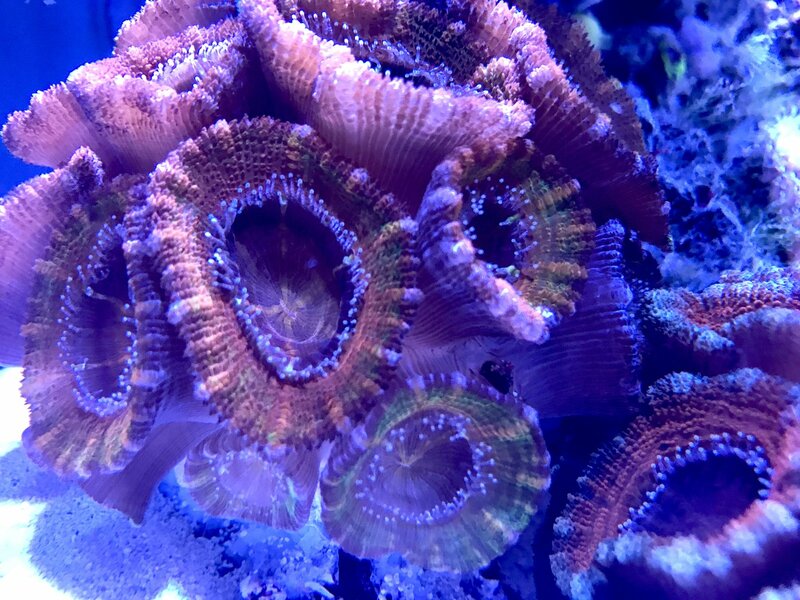 Some people swear their acans color up better up on the rocks in high light but that doesn’t work for me.. 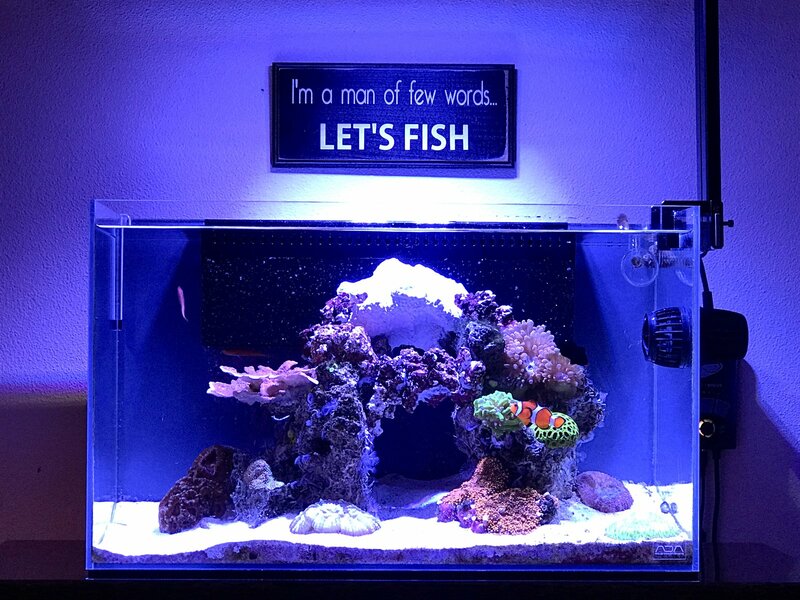 So I posted the picture with the new scape on the first page , let me know what you guys think. Basically I wanted to separate the 2 main rocks to get better flow in between them and connected them together up top with a Rock-Mag jr. I secured it via magnet to the overflow and right below it created some type of bridge which gave me 2 nice caves now where fish can hide and flow in the dead spots has improved dramatically. There are 2 things I kinda dislike but I’ll live with them. First is the Rock-Mag jr is super white and will take a while to be covered with coralline . 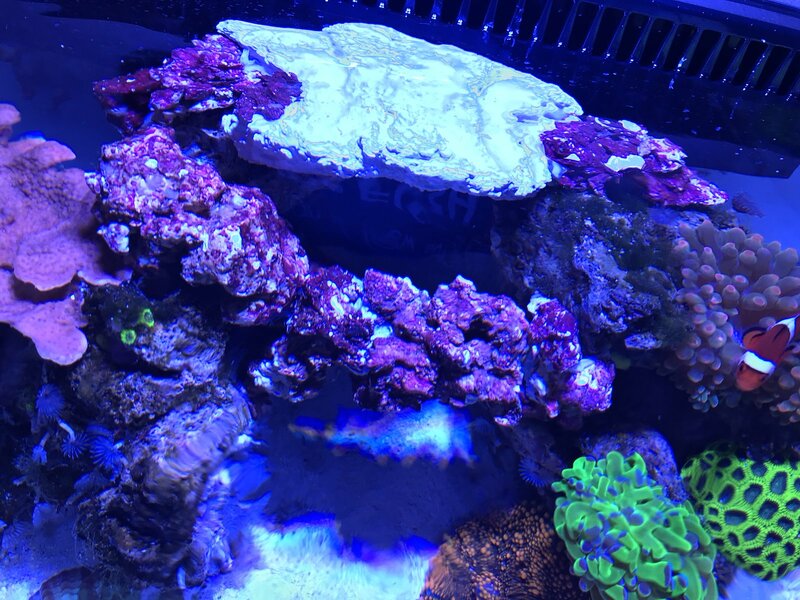 Second , the rock structure is just 2” -3” below the water line, so no SPS up there but I was actually thinking of a blue maxima on the top or some type of encrusting Montipora. The “bridge “ will be exclusively covered by zoas. More pictures to come soon. Here’s a poor picture of what it looks like from the top. Little update. Pajama Cardinal is out of the tank. 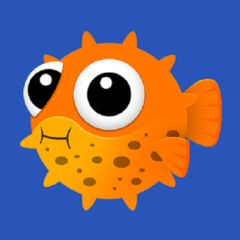 Didn’t really enjoy that fish, seemed so motionless and boring plus the colors aren’t really there. Male is 2 times larger than the females. No nipping or aggression from my clowns either which is a plus, the Anthias swim around the clowns and they don’t seem to mind. They’re getting along just fine. 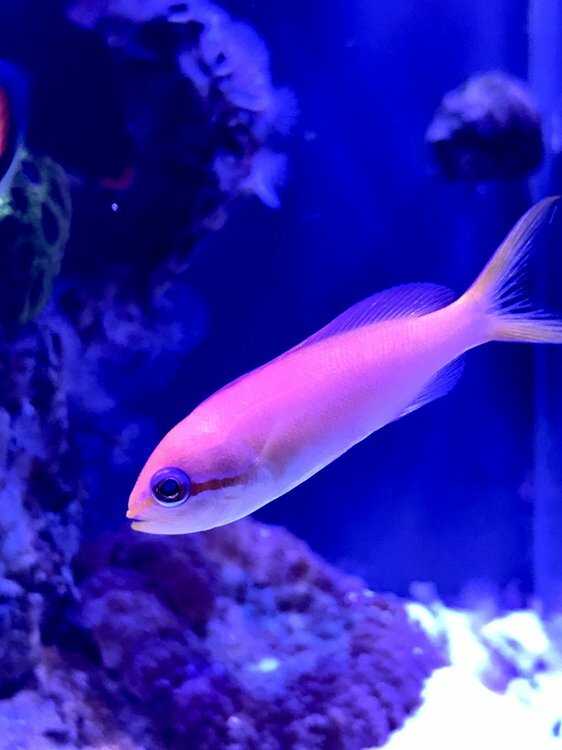 I upped the feeding to 2 times a day, feeding PE Mysis and Callanus which is perfect for Anthias. 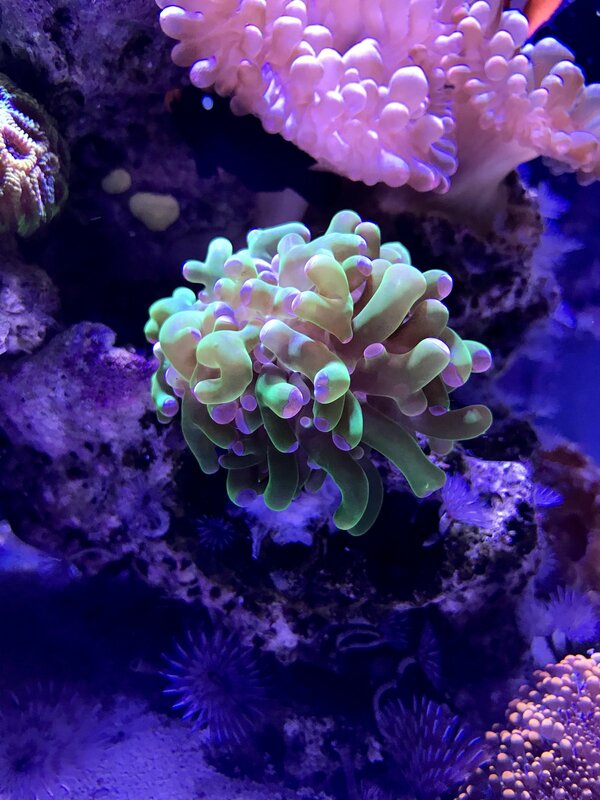 months , but for now they’re doing awesome. 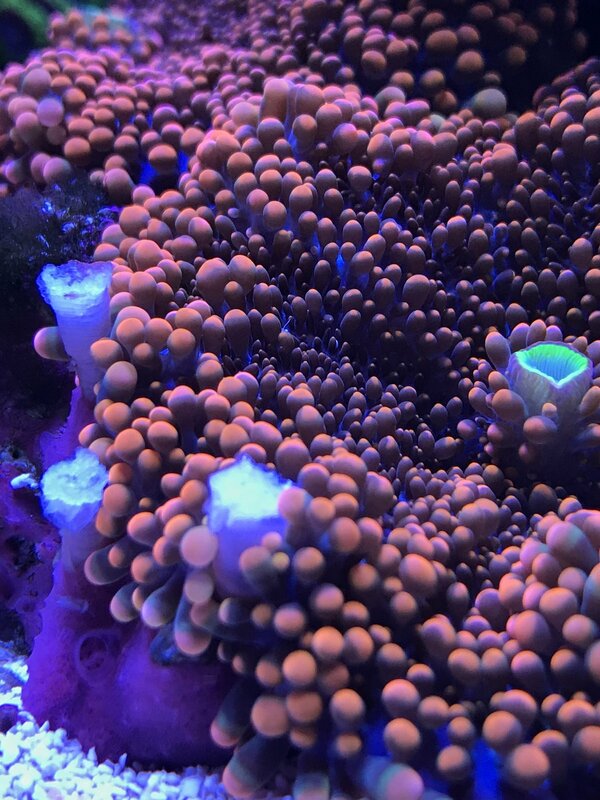 Also added a forest fire montipora, the encrusting type. Green base is somewhat faded but still there but I do expect it to get better . 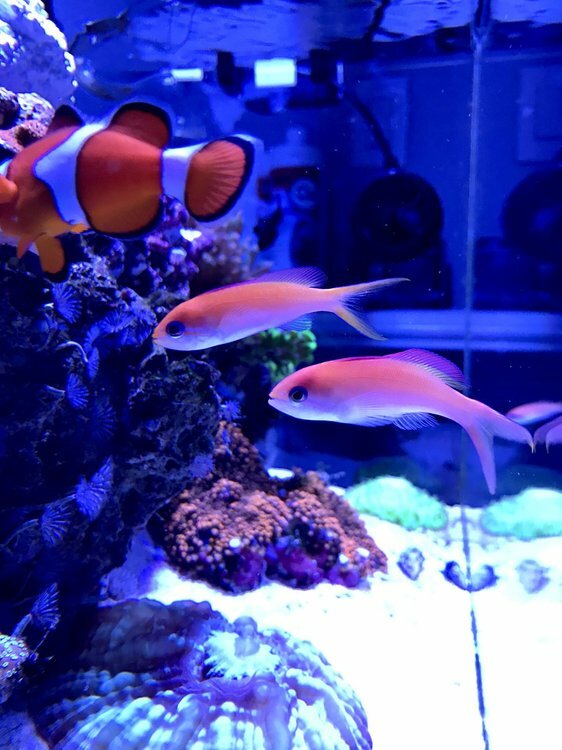 I have to say the concern with Anthias in a Nano, is more or less the feeding schedule they require and the consequently dirty water as a direct result to heavy feeding. After close to 2 weeks now with the Ignitus Anthias trio in my tank, feeding 2 times a day , no algae of any sort growing in my display as a result to the extra nutrients . 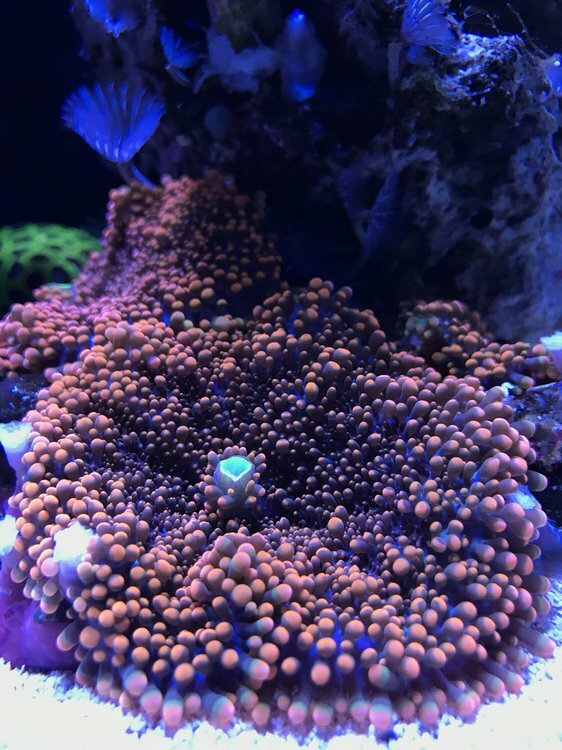 My skimmer is slightly oversized for my tank which is perfect, I do notice it’s pulling a lot more gunk out of the water whereas before was barely cruising with very little in the collection cup. Still dosing amino acids like before. Phosphates and Nitrates detectable but very low. All in all its working out very well, we’ll see how the Ignitus fare over the next few months. Very hard to photograph these guys since they’re so fast but here’s a couple pictures . Alright this is awesome...seems like shade works wonders on rainbow acans. Moved them a while back into the shade and I see more and more color coming out compared to the orange they were in direct light for the past few months. 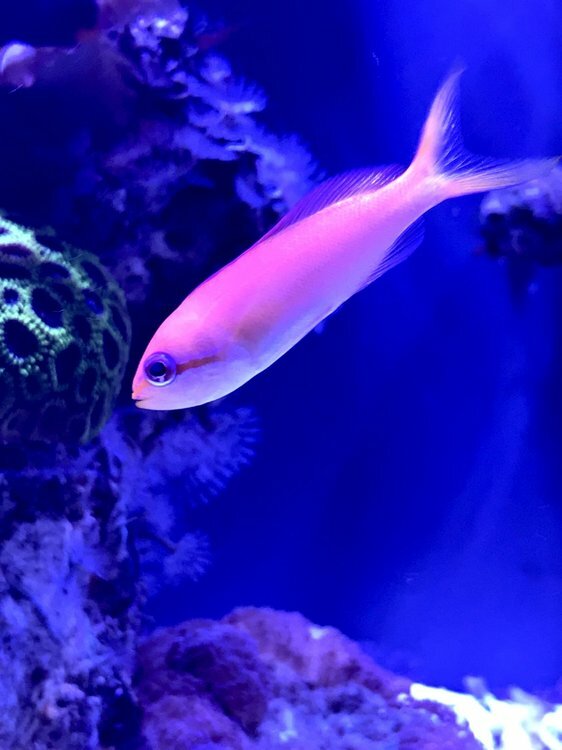 Good choice on the cardinal I think, those guys are ugly as hell, that anthias is awesome a much better replacement. Lol no kidding. 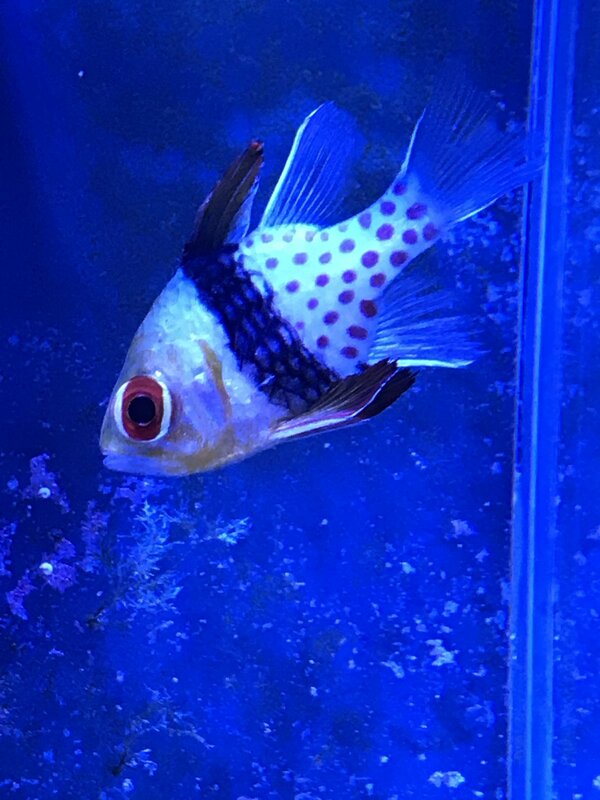 Took me by surprise though, when trying to net him out, he suddenly turned into a very fast swimmer compared to the montionless behavior they’re known for. What a pain that was, took me a while to get him out. I also have an acrylic fish trap but I’ve had minimal success with it...probably the fish have to be dead hungry to get in there....otherwise you better get 2 nets out and try to catch the buggers. Been using Aquavitro Salinity salt for the last 300 gallons worth of water changes....gonna switch back to ESV salt and 2 part system , because the salt mixes up so clear and the parameters are spot on every time even though it takes a bit of extra work to weigh in the dry parts. Seachem Salinity mixed pretty cloudy and that’s the main reason I’m switching back to ESV otherwise its a great salt. 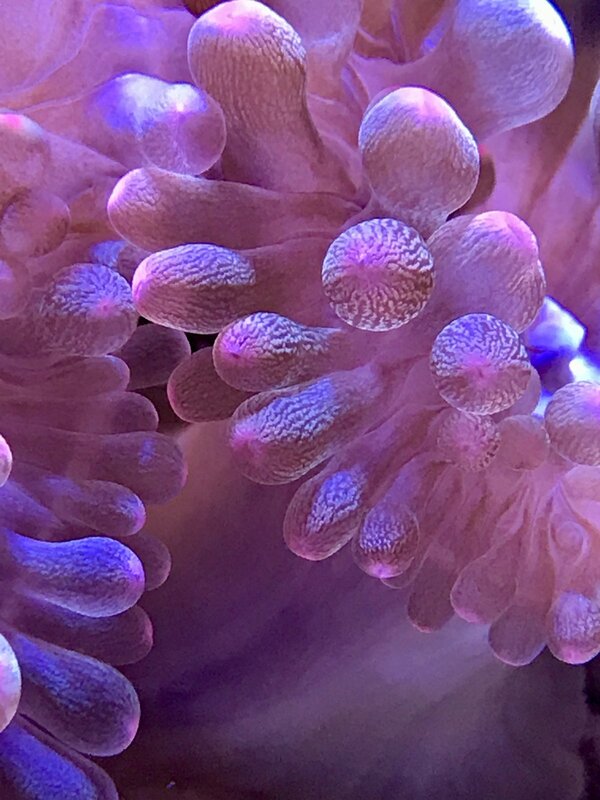 I put a Cobalt MJ mini 404 powerhead in the refugium hoping it will help with chaeto growth since its pretty stagnant at the moment ...not much movement in the refugium before adding the powerhead....now Ive got about 100GPH from the Cobalt plus whatever the drain gph is...not really sure. I added a week or so ago a TaoTronics 36W grow light, hopefully that along with the flow will get this thing to grow. 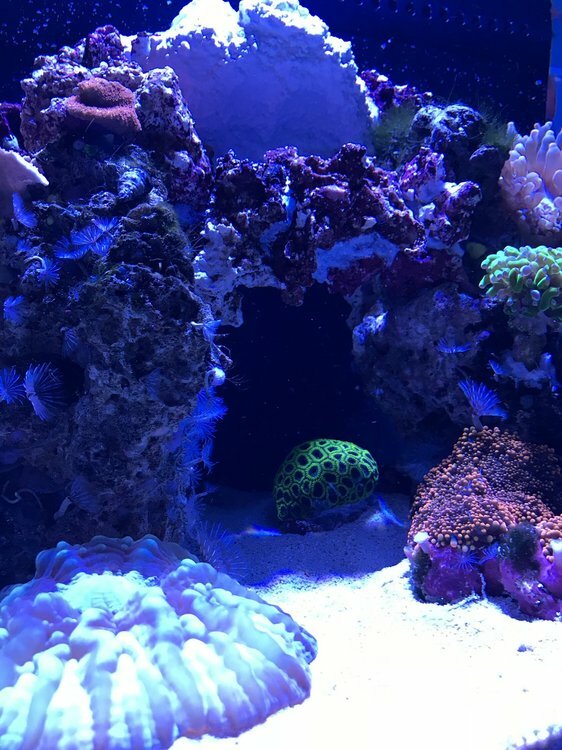 Moved the Favia under the ledge, it’s getting a bit of light through the opening between rocks which is kinda cool but reason I had to move it is because it was sending sweepers at night and beating on my frogspawn and my BTA if you can believe that. I mounted it on a rock in the sand. Hopefully it’ll do well since they’re supposed to like low light. 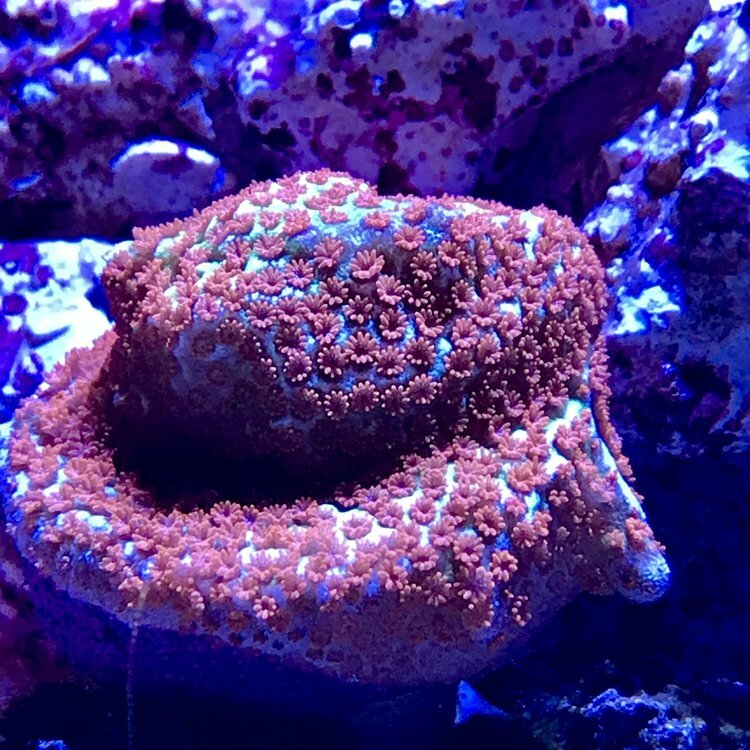 Pretty much no sweepers last night from the favia and it looks happy in that spot. Took out the Ricordea Yuma rock and glued the vermetid tube ends . 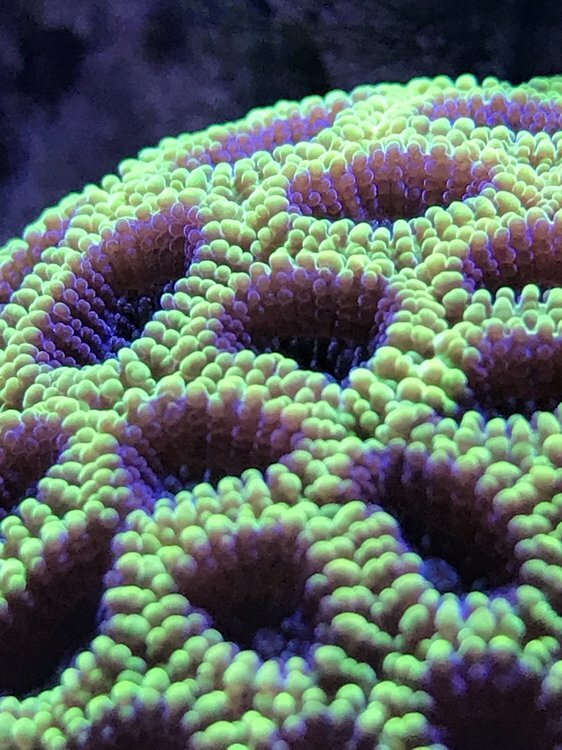 No more nasty netting covering the corals at feeding time. 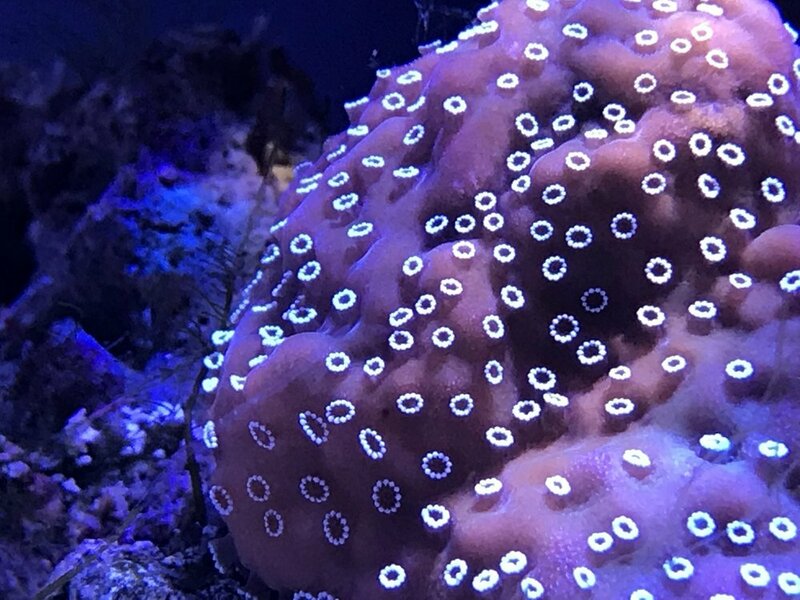 See the white tube tips in the pic below. 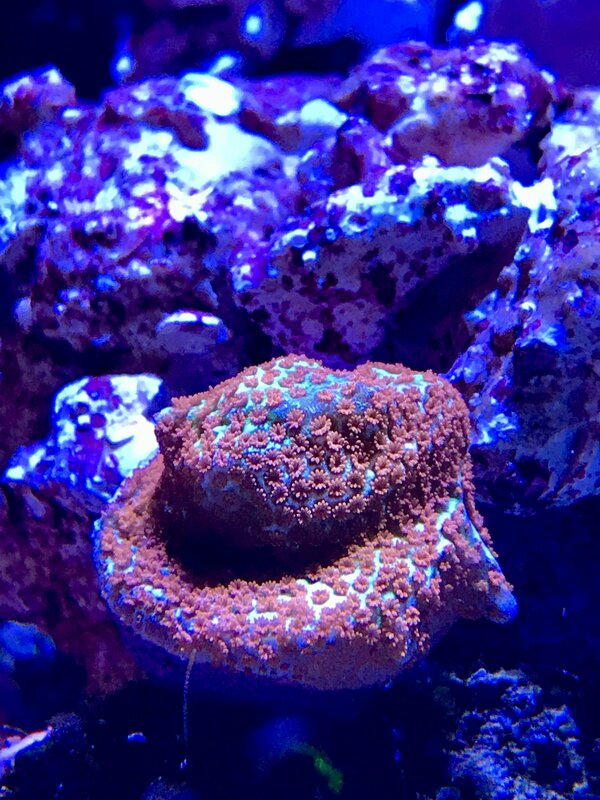 Upon closer inspection, the ricordea rock has a new baby ricordea. 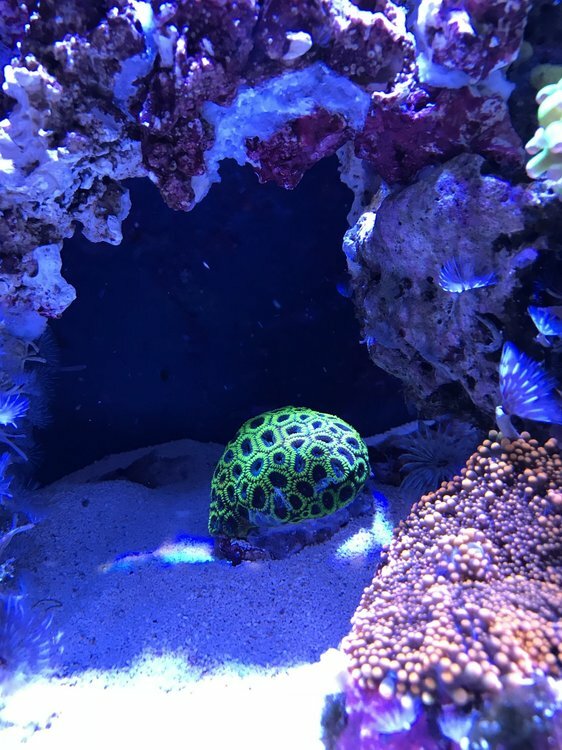 More green than orange, this tiny thing is sure a welcome sight. Have I told you my yumas dovour salmon? They won’t eat anything else but will eat salmon . I’ll make a video later today of them feeding. Pretty cool stuff. 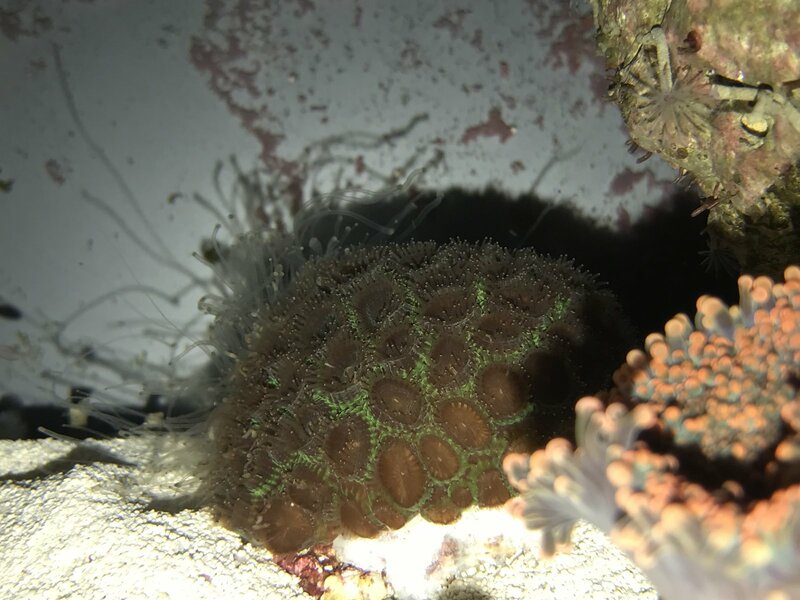 Speaking of the nasty Favia, it saw itself banished on the sand and it decided to go to war. Sweeper galore !!! !